This post is part of our blog series by our Art Therapist, Ally Root. Ally is passionate about the ways in which the creative arts can bring healing, and she will be sharing her thoughts here along with projects that she has completed with the children at our Care Center in Ghana. You can read Ally’s previous posts on art therapy in our blog archives. Collage is an excellent medium to use in an art therapy setting. For individuals who may not feel completely confident in their drawing abilities, collage is a great way for them to express themselves creatively without the pressure of making a realistic drawing. Additionally, the act of cutting and ripping images and gluing them together can be cathartic for some. Collage gives artists the opportunity to pull pieces from their surrounding environments and form their own collection of images and words that have personal meaning to them. From these pieces, they can create their own unique entity that reflects their inner world. Using old newspapers to compile images into collages is a favorite activity with the children at the Touch A Life Care Center. Upon request, the oldest boys at the care center participated in a free collage-making directive. The boys used old newspaper and glue to create their own original works. While they worked, they listened to music playing in the background. They were so focused on what they were doing that they hardly spoke! Although no set theme for the collages was discussed beforehand, many common themes appeared in the collages including sports, friendships, and love. Upon completion of the collages, the boys walked around to look at one another’s work. They then participated in a group discussion during which each participant chose one image from their collage to share with the rest of the group. Many shared that they hope to find love in the future. Some placed importance on finding a home to live in. Others explained that the images of people holding hands and smiling made them feel good because they liked togetherness and camaraderie. 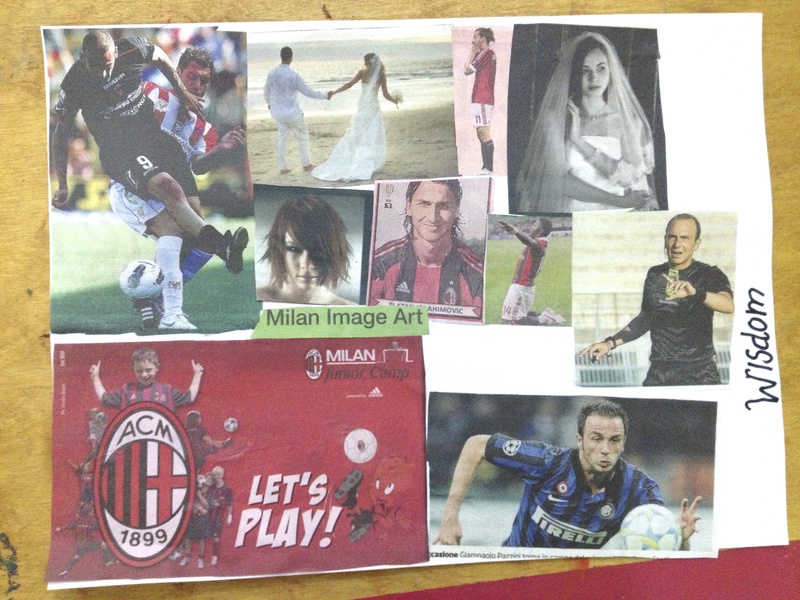 One thing all of the collages had in common were numerous images of football players! The experience created a bond between the participants in the group as they shared their interests and ambitions for the future through the process of making art.